Today I did a repeat of last week’s four hill climb. With a total of 84 miles and 8,600 feet of climbing. 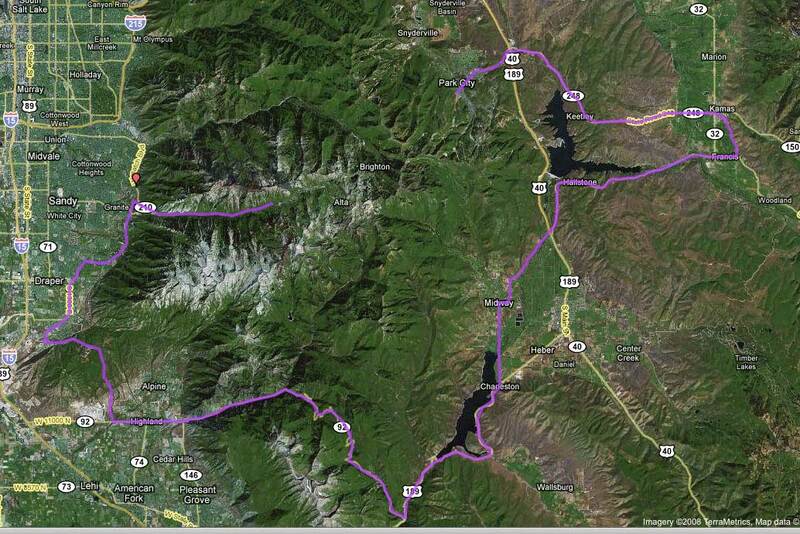 I started from our Utah house and biked up Provo Canyon, then made the first big climb up the Alpine Loop. After descending down the American Fork canyon I made my way over to the next climb, up Suncrest. After reaching the summit I headed down the backside, called Transverse Ridge, that takes me down to Draper in the Salt Lake valley. This is the turn around point and I retrace my steps back, up Transverse Ridge, down Suncrest, up American Fork Canyon and down the Alpine Loop, back home. Here is the route map. You can see from this profile that is mostly going up or down (click graph to enlarge). My Polar heart rate monitor shows 8,500 feet of climbing. Bikely.com shows over 10,000 feet. I was able to improve all my climb times, except for Suncrest. Last week I had met up with another cyclists and was pushing hard up Suncrest, hence the difference. After returning home, Ann and I went on a tandem ride up South Fork. That brought my total riding for the day to 110 miles. Here are the comparisons between the two weeks. Great roads, great weather, and friendly riders sum up our experience with riding the Cache Valley Century. On Friday we drove up to Logan Utah to stay the night. After a lousy experience at an expensive Italian restaurant in the town, we returned to the motel to get an good nights sleep. Before 6 am, we got up to get ready. The Best Western motel we were staying at had a great breakfast buffet so we fueled up before heading up the 12 miles to Richmond for the start. We started at 7:30 am, along with two other tandem riders we knew. We rode with them for maybe 15 miles until we had a long gradual climb, where we pulled ahead. Since we had to get back home for a party that day we decided to proceed without them. We were zooming along and would continue to pickup riders as they would join the long train of riders that were following us. At times we would take a break and move back in the pack. At mile 40 we made a stop at the second rest stop (we skipped the first one). After a short stop we were back on the bike, skipping the 3rd rest stop, and stopped at mile 71 for the lunch stop. They had a great lunch for us. After lunch we started to form long pace lines again. We were doing much of the pulling, but did move to the back of the pack to get some recovery. About 10 miles from the finish, the rider in front of us did not have time to signal a bad pot hole. Although he was able to miss it himself, without any warning we hit it straight on. It was a real jolt. One of our water bottles flew out. As we came to a stop we saw we had flatted on the front. After changing the tube we were off again. But when I had to touch the brakes the first time I felt some grabbing, realizing that that pot hole had done some damage to the rim on our front wheel. We rolled into the finish averaging 20.2 mph, a total of about 5 hours riding time, and about 40 minutes of stopping time. It was a lot of fun. Except for the flat, which could happen on any ride, it was a very enjoyable century and one we would like to do again in the future. When you can compare this with how we did on the recent Ulcer Century, you can see we averaged almost the same overall speed, but my average heart rate was significantly lower. Must be the clean air up in Cache Valley. No wonder I am exhausted! Last September I wrote a blog entry about climbing almost 100 miles. This year I am climbing even more and have now reached 530,000 vertical feet of climbing, which is over 100 miles up. That is like climbing all the steps of the Empire State Building 433 times, about twice a day for every day so far this year. Click the graphs to view enlarge. 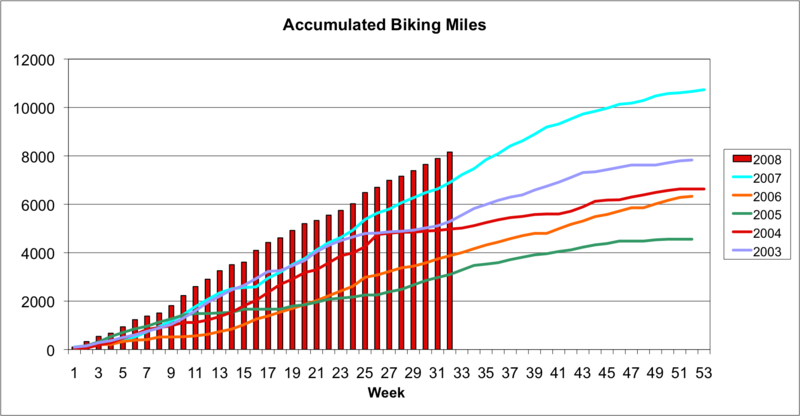 At the same time I have biked over 8,000 miles so far this year. More than half of those were on the tandem. We got up early to make a climb up Squaw Peak before the warm temperatures arrived. It was rather cool with a head wind as we made our way up Provo Canyon. We exited from the bike trail over to the busy highway about a half of a mile before the entrance to the Squaw Peak road. Franz had made the climb earlier in the week with a time of 31:51 so we wanted to see how long it would take on the tandem. Our tandem time last year, when we first made the climb, was 47:03. We were sure we could beat that. We pushed hard all the way up but did hold back some since we have a fast paced ride with the Utah Velo club this evening. We finished in under 40 minutes, for a new best time for us. The climb up Sqaw Peak is 4.3 miles with a 7.4% grade. It is similar to the backside of Mt. Hamilton where the grade is close to 7.9% and the miles of the climb are a bit further. We felt so good about our climb that when we got home we signed up for another century ride in a couple of weeks. The weight and heart rate numbers in the table below are for Franz only. Not doing that much climbing last week, I decided today to make the climb up Squaw Peak twice. This climb is similar to the backside of Mt Hamilton in terms of distance and average grade. The first time I pushed hard to see if I could set a new best time on the climb. I was able to shave more than 30 seconds off, even though I we did a 111 mile century ride yesterday on the tandem. The nice thing about finding a new hill to climb is you can set a new PR. I have started to add a parameter to my tables to show the feet of climbing per minute. For thie climb today it came out to be 50 ft/min. 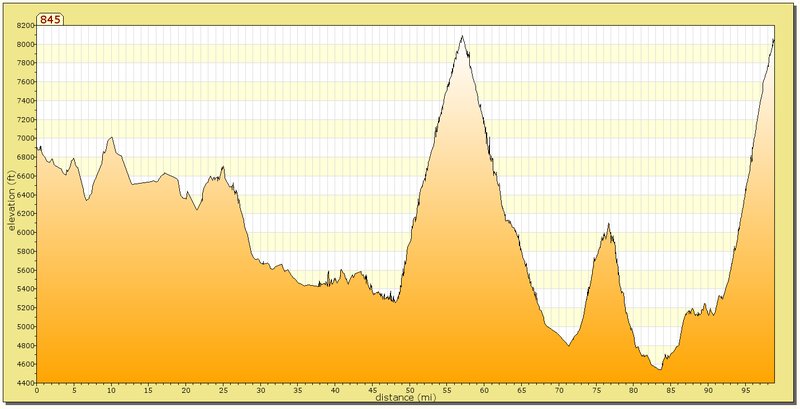 My best times up Metcalf this year comes out to be 64 feet per minute but that is a much shorter climb. My hill repeats up Thomas Grade also come in more than 60 feet per minute. Considering a 32 minute climb I was very happy I could climb 50 feet per minute. I took a look at my climbs up the backside of Mt. Hamilton. These were part of a long ride and I was not pushing the pace but show them here as a comparision. We finished the 111 mile Ulcer Century today. The teams that were doing the team time trial went off at 7:20 AM and we left soon after that. Unlike last year, this year we saw a lot of riders go down. One rider was down at mile 5 as we passed by. He had a very bloody face standing on the side of the road surrounded by his teammates. We initially stayed in a big pack and found it took a lot of concentration because some of the riders were less than experienced riding in a pace line than they should be for those 24 mph speeds we were going. One of the riders to the right of us hit a cone in the road when going through a round about and swerved to the right nearly going down and taking the rider to his right down too. It is a good thing that we left some extra distance and stayed on the side of the pack because at about mile 20, several riders went down at the front of the peleton we were in. We heard later that the front rider thought there was a right turn but then then suddenly corrected himself to go straight and someone touched a wheel. We had enough of that so we decided to only pull, ride by ourselves or draft with a small group. We started to pass a lot of riders, including the teams and a large peloton formed behind us. We kept pulling for many miles until the rollers convinced us to slow the pace down and the riders went ahead. We saw a couple more riders who had gone down as we passed by. A bit scary. Our first 62 miles was faster than last year, averaging 22 mph hour up to the lunch stop. I think we went out too fast because we had to slow the pace after lunch, but still finished with a total time of 5:52, so we met our goal of doing it under 6 hours. We arrived at the finish line at 1:14 pm, compared with 1:37 pm last year. Ann had some cramping starting at around mile 70, but she kept working through it. But you can see Ann looked great at the finish! Franz’s average heart rate of 148 was significantly lower than last year;s 155, showing that Ann had really improved. This table shows a comparision with last year. I have updated my log with the training I am doing for the Everest Challenge and Furnace Creek 508. The Everest Challenge occurs two weeks before the 508. 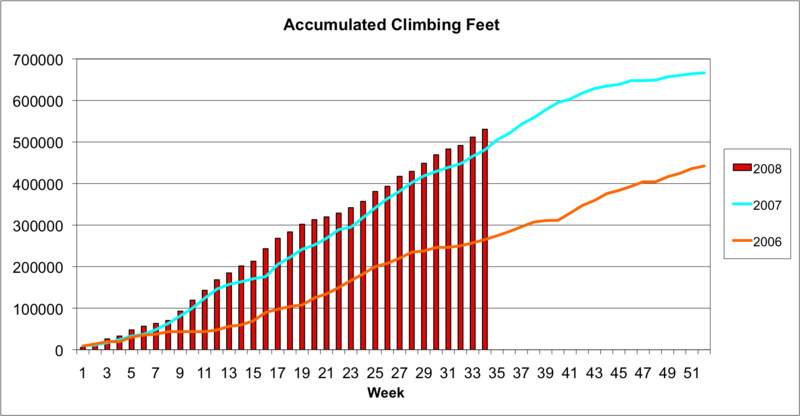 My miles are on track but my climbing is not quite there yet. I am getting my weight down. See here for all the latest charts.